Learn Hangul | Learn the Korean alphabet known as Hangul quickly and easily! Hangul is the official alphabet of the Korean language and it’s used in both South and North Korea. The alphabet was created in the year 1443 in the Joseon Dynasty. The name of the Korean alphabet, Hangul (한글) means great script in Korean. Han (한) means great and Geul (글) means script. The most interesting feature of the Korean Alphabet is the design of the letters. The shape of each letter is designed after the features of the sounds they represent. Consonants are based on the shape your mouth makes when you pronounce them while vowels are made from easy to identify horizontal or vertical lines. The character ㄱ for example is the shape your toungue takes when you make a “g” sound. Each consonant has its own name. ㄱ for example is called giyeok (기역). The vowels are just named after the sounds they make like “ah” for the vowelㅏ. My name is Haneul. I was born into a Korean family but grew up in Canada. I never really learned Korean until I was in my 20s when I decided to teach myself so I could communicate better with my extended family. Today I’m fluent in Korean and I live in Seoul South Korea. I built this website to help other people learn Korean like I did. My hobbies include reading, watching Korean dramas, listening to K-Pop and cooking all kinds of different food. We’ll start by learning all the consonant characters in the Korean alphabet. Every Hangul letter has a name and it’s own sound. Some characters even have multiple sounds depending on whether or not they’re at the beginning of a word, beginning of a syllable or the end of a word. Here are the Hangul consonants, their names and the sounds they make. The vowels in Hangul, the Korean alphabet don’t have names like the consonants do, instead they just have one sort of simple sound. A lot of the vowels have very similar sounds so do your best to try to figure out the difference. You’ll notice that adding another line to it essentially ads a y to the sound and adding a ㅗ or a ㅜ is like adding a w sound to the vowel. Now that you’ve had an introduction to the Korean alphabet you’re ready to start combining these characters into syllables and start writing words! In the Korean alphabet the different Hangul letters aren’t written one after another like in English. Instead they’re stacked into little blocks for each syllable. Combining the different Hangul letters together is easy. The first common type of combination is simply one consonant and one vowel. The consonant here is “k” and the vowel is “a” which gives this syllable a “ka” sound. The consonant here is “s” and the vowel is “a” which gives this syllable a “sa” sound. The consonant here is “m” and the vowel is “o” which gives this syllable a “mo” sound. The consonant here is “r” and the vowel is “i” which gives this syllable a “ri” sound. Next we have syllables made up of three Hangul letters. These are simply consonant plus vowel plus consonant. The first consonant here is “t” followed by the vowel “a” and ending with the consonant “l” for a “tal” sound. The first consonant here is “n” followed by the vowel “eu” and ending with the consonant “n” for a “neun” sound. The first consonant here is “r” followed by the vowel “a” and ending with the consonant “m” for a “ram” sound. The first consonant here is “m” followed by the vowel “o” and ending with the consonant “t” for a “mot” sound. When writing these 3 character syllables you have to remember to pay attention to the sounds of the consonants. Many Hangul consonants have a different sound if they’re at the start of a syllable and a different sound at the end of a syllable. You’ll also notice that these characters are read from left to right and top to bottom. Sometimes you write the characters in a vertical stack of three Hangul letters and some times you write two beside each other with the third one below them. As you get more familiar with writing the Korean alphabet you’ll start to get a feel for how the letters fit together properly. The next type of syllable you’ll encounter in Korean is a syllable that begins with a vowel. These can be either just one vowel or a vowel followed by a consonant. However things are a little different for characters that start with vowels. You can’t have a syllable block starting with a vowel for some reason so instead you have to put the silent character ieung (ㅇ) before the vowel. In some cases you’ll even see syllable blocks written with 4 Hangul characters although these are not as common as the 2 or 3 character blocks. Here are some examples of Korean words written in Hangul. You should be able to read or sound them out easily now. If you were able to read these words then congratulations, you’re well on your way to becoming fluent in Korean! 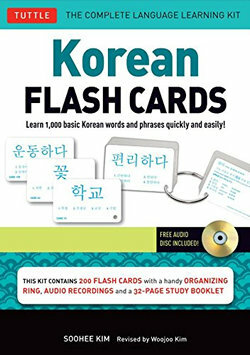 To help you memorize the Korean alphabet I’ve created these simple to use Hangul flash cards. Simply download the pdf files, print them on card stock or some kind of other thicker paper, cut them out and start memorizing! There are two pages of flash cards and four files, page 1 front and back and page 2 front and back. They’re designed to print on both sides of the paper. You might have to play around with your printer and test print a couple of times until you get the cards lined up correctly on your specific printer. The English answers for the Hangul consonants and 1 vowel. Despite being born into a Korean family because I lived in Canada my whole life I never really learned Korean. I was able to pick up a few odd words and phrases from my parents sure but I was never able to really communicate with my older relatives who didn’t speak any English. When I was 22 I visited South Korea for the first time and when I returned I was determined to finally teach myself Korean. I tried many different books, courses and websites, some were definitely better than others (I have listed a few I like below). Everyone has their own ways of learning and for me Rocket Korean was the one I clicked with the most. I was able to effectively communicate with my older relatives after about 6 months of serious study! I’ve since moved to Seoul and I’m very confident interacting with the people who live here. Below is a little bit more information about my current favourite Korean language learning tools. A lot of language books can be intimidating but this one seems to make the learning fun and easy with its cute art and practice sections with answer keys. Audio files to accompany the book are also provided. If I had to choose only one beginner book to use for self study, this would be the one. These are a great learning tool to help you learn 1,000 basic Korean words and phrases quickly and easily (Hangul & Romanized Forms). 4 related words and phrases to help you use it.